I thought these were amusing predictions from the Toronto Sun for 2017. Somewhat relevant with the current cast of leaders. Let us hope that the red rooster’s impulsive and hasty nature does not “trump” strategic and measured responses. Another fun and exciting year in our global neighborhood! The Chinese New Year is coming up January 28, and this year is the Year of the Rooster. Every year, world-renown astrology Eugenia Last presents a special horoscope celebrating this auspicious occasion. The United States will need to practice control, striving to obtain the perfect balance between diplomacy and strong-arming any opponents that might want to challenge or take privileges without asking. It will be of utmost importance that strategy supersedes the temptation to act in haste and without the general consensus of superpowers around the world. Showing excellence and integrity along with compassion and logic will be required during many muddled moments that could result in hasty reactions based on assumptions instead of facts. A steady hand and willingness to work in unison with the majority will mark the outcome of a year riddled with posturing. It will take strong, savvy leadership to navigate through the challenges that face the world physically and financially. Canada will strengthen its relationships within the global network of countries fighting for freedom and peace on earth. The contributions made by this nation will set an example on the world platform that will inspire others to follow suit. The 2017 Fire Rooster year will radiate authority and precision in order to bring about control, however not without plenty of drama to assure his presence is felt on a world level. This is a year where pressure and persuasion will be applied to vie for power, making it necessary to join forces with those who share the same values and environment concerns. The United Kingdom will face its own challenges, but a steady pace to strengthen and bring about positive change is apparent. However, it could still be subjected to homeland security issues, leaving room to be threatened by outside sources trying to undermine this great nation’s intelligence and courage to stand tall and remain united with its allies. It will be time for the British to use past experience and intelligence to contribute to and bring about a worldwide plea for universal solidarity. IN THE Bible, seven years of feast were followed by seven years of famine. For banks there have been ten lean years. Subprime-loan defaults started to rise in February 2007, causing a near-collapse of the industry in America and Europe. Next came bail-outs from governments, then years of groveling before regulators, mass firings of staff and quarter after quarter of poor results that left banks’ shareholders disappointed. Now, a decade later, the moneylenders are quietly wondering if 2017 is the year in which their industry turns a corner. Over the past six months the FTSE index of global bank shares has leapt by 24%. American banks have led the way, with the value of Bank of America rising by 67%, and that of JPMorgan Chase by 39%. In Europe BNP Paribas’ market value has risen by 52%. In Japan shares in the lumbering Mitsubishi UFJ Financial Group—the rich world’s biggest bank by assets—have behaved like those of a frisky internet startup; they are up by 57%. Predictions about global banks’ future returns on equity have stopped falling, note analysts at UBS, a Swiss bank. Some of the biggest casualties of the financial crisis are even expanding. On December 20th Lloyds, bailed out by British taxpayers in 2009 at a cost of $33bn, said it would buy MBNA, a credit-card firm, for $2bn. The excitement can be explained by three Rs: rates, regulation and returns. Consider interest rates first. The slump in rates has been terrible for banks. Between 2010 and 2015, the net interest income of the rich world’s 100 biggest banks fell by $100bn, or about half of 2010 profits. When rates across the economy rise, by contrast, banks can expand margins by charging borrowers more, while passing on only some of the benefit of higher rates to depositors. So bankers have been watching the bond market with barely concealed joy. Ten-year government yields have risen by one percentage point in America, and by 0.30-0.64 points in the big euro-zone economies and Japan over the last six months. Investors are talking about a Trump-inspired “reflation”: the president-elect promises to embark on a public-spending boom. In Germany inflation is at a three-year high of 1.7%. Banks’ CEOs are also chipper because they think that regulation has peaked. In America the new administration is likely either to repeal the Dodd-Frank act, an 848-page law from 2010, or to prod regulators to enforce it less zealously. Bank-bashing fatigue seems to have set in among the public. True, when firms misbehave, there is still a firestorm of outrage. John Stumpf, the boss of Wells Fargo, quit in October after his bank admitted creating fake accounts. But many people can see that power has migrated from banking to the technology elite in California. The brew of high pay, monopolistic tendencies and huge profits that attracts populist resentment is now more to be found in Silicon Valley than in Wall Street or the City of London. Global supervisors are still cooking up new rules, known as “Basel 4” (see article), but are unlikely to demand a big rise in the safety buffer the industry holds in the form of capital. The strongest banks are signaling that they will lay out more in dividends and buy-backs, rather than hoard even more capital (today, the top 100 rich-world banks pay out about 40% of their profits). A third reason for optimism in bank boardrooms is returns. Global banking’s return on equity (ROE) has crept back towards a respectable 10%. The worst of the fines imposed by American regulators are over. So far, “fintech” startups that use technology to compete with rich-world banks have not won much market share; banks have used technology to boost efficiency. They have also got better at working out which of their activities create value after adjusting for risk and the capital they tie up. Barclays, once known for cutting corners, says it can calculate the ROE generated by each of its trading clients. It is ditching 7,000 of them. Given the giddy mood, the big danger starts with a C, for complacency. Regulators believe that banks now pose less of a threat to taxpayers. American lenders have $1.2trn of core capital, more than twice what they held in 2007. Citigroup, the most systemically important bank to be bailed out, now has three times more capital than its cumulative losses in 2008-10. European banks’ capital buffers have risen by 50% since 2007, to $1.5trn. Yet there are still plenty of weak firms that could cause mayhem. Deutsche Bank, several Italian lenders and America’s two state-run mortgage monsters, Fannie Mae and Freddie Mac, are examples. Mega-banks may simply be too big for any mortal to control. For every dollar of assets that General Electric’s Jeff Immelt manages, Jamie Dimon at JPMorgan Chase looks after $5. And banks still lack a post-crisis plan beyond cost-cutting. Despite their surging shares, most are valued at around the level they would fetch if their assets were liquidated, which hardly indicates optimism about their prospects. Before the crisis, they inflated their profits by expanding in unhealthy ways. They captured rents from state guarantees, created ever more layers of debt relative to GDP, and grew their balance-sheets by means of heavy over-borrowing. They have reversed much of this expansion over the past decade but that strategy cannot go on forever. In 2017 banks will need to articulate a new growth mission and show that they can expand profits without prompting public outrage or a regulatory backlash. One area of promise is the drive to raise rich-world productivity. That would boost economies broadly, and their own profits. There is plenty that banks could do: get more credit to young firms, improve payments systems so that a higher proportion of midsized firms can engage in cross-border e-commerce, and harness technology to make banking as cheap and easy to use as a smartphone app. Forward-thinking bank bosses are already emphasizing such goals. If they could achieve them over the next decade, they might even realize a fourth R—redemption. 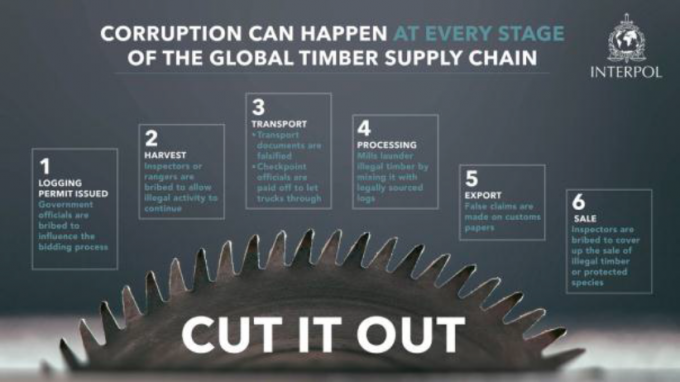 A recently released Interpol report underlines the scale of criminal activity tied to the forestry sector and the importance of coordinating anti-corruption efforts to protect forests. To this end the key measures that the report recommends include capacity building across the entire law enforcement chain, enhanced financial investigation techniques, and adoption of Interpol’s I-24/7 global secure communications network for anti-corruption investigators. 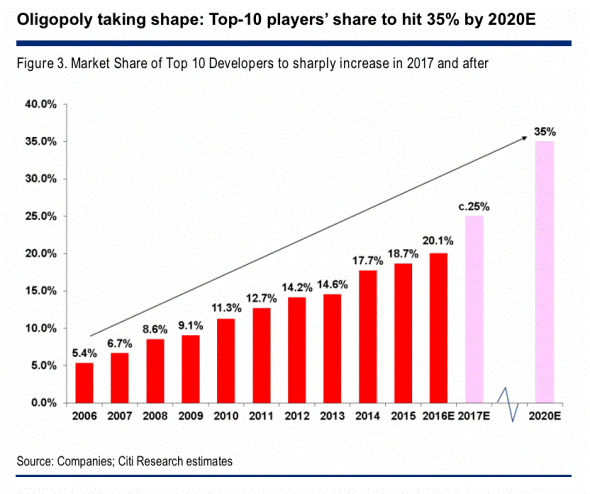 To be fair to China property bulls though, China’s developers are not new to the cycles of the property market and the assumption is always that the government is keen to defend land and property value since so much of the highly-leveraged economic edifice is built upon it. Land (and construction) has an outsized role in GDP growth and is used as collateral in local government, individual and corporate borrowing — the local government bit being extremely important during the fiscal expansion of the past few years. Fiscal revenues (mainly tax-related revenues such as business taxes, propertyrelated taxes, etc) and government fund income (dominated by revenues from land sales) are the key sources of direct income for local governments. They also enjoy tax returns/transfers from the central government to subsidize investments and expenditures. According to our analysis, property-related tax revenues and land sales proceeds jointly account for 42% of local governments’ direct income (fiscal revenues + local government funds). The property market, in short, has become the critical income source for local governments. This is the key reason why we believe a property market collapse could be ill afforded by central/local governments, though they do hope for a cooling of the property market. .. 2017 is a “politically” important year for China given the 19th National Congress of the Communist Party of China (中国共产党第十九次全国代表大会) will be hosted in 2H (around Nov). Before this meeting, “stability” will be the watchword, in our view, making it unlikely that there will be significant reform of the land system. We look forward to it all continuing in a linear, forecast able manner. 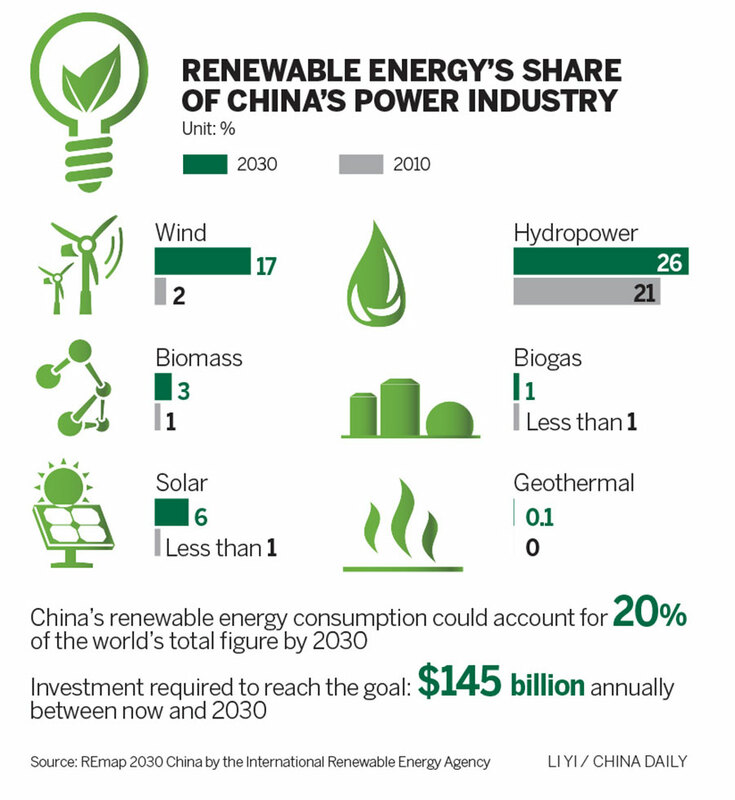 China is strengthening its dominance of the global renewable energy industry after increasing investments in green technology overseas to more than $32bn — far in excess of the amounts deployed by any other country. The 60 per cent surge in Chinese capital last year highlights the country’s increasing economic commitment to low-carbon forms of energy even as Donald Trump, the US president-elect, threatens to weaken Washington’s backing for the shift away from fossil fuels. China is already investing more than $100bn a year in domestic renewable energy projects — more than double the US figure — and the latest data show that Chinese money also dwarfs US green finance globally. “As the US owned the advent of the oil age, so China is shaping up to be unrivaled in clean power leadership today,” said Tim Buckley, director of energy finance studies for the Institute for Energy Economics and Financial Analysis, a US-based think-tank. Chinese companies made 11 outbound investments in excess of $1bn in 2016, adding up to a combined $32bn, compared with eight deals for a combined $20bn in 2015, according to research by IEEFA. These ranged from an offshore wind farm in Germany and a solar power project in Egypt, to an Indonesian hydropower plant and lithium production for electric vehicle batteries in Chile. 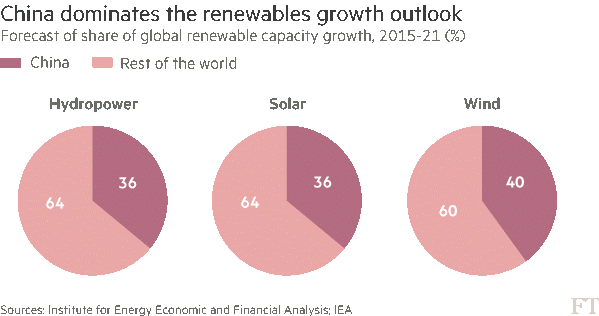 Four of the five biggest renewable energy deals worldwide in 2016 were made by Chinese companies, according to Mr Buckley, and he predicted this trend would continue irrespective of any change in approach by the US. By far the biggest of the deals struck in 2016 was the acquisition of a controlling stake in CPFL Energia, one of Brazil’s biggest generators and distributors of renewable power, by State Grid Corporation of China as part of a proposed takeover expected to total $13bn once completed. Mr Trump, who once tweeted that climate change was a Chinese hoax to undermine US competitiveness, promised before his election to withdraw the US from the Paris climate accord and sweep aside many of the commitments to cut fossil fuel emissions that the US had pledged as part of the agreement. However, he has since said he has an “open mind” on the issue. 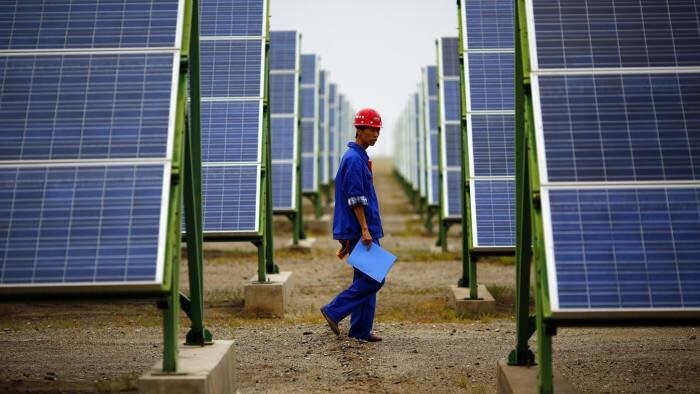 Sam Geall, a specialist on low-carbon technology in China at the University of Sussex, said Chinese capital had become a more important driving force behind the expansion in renewable energy capacity around the world than US policy. The 2015 UN climate agreement in Paris was only possible, he said, because of the rapidly declining cost of replacing fossil fuels with renewable energy — a trend he attributed in large part to Chinese investment. 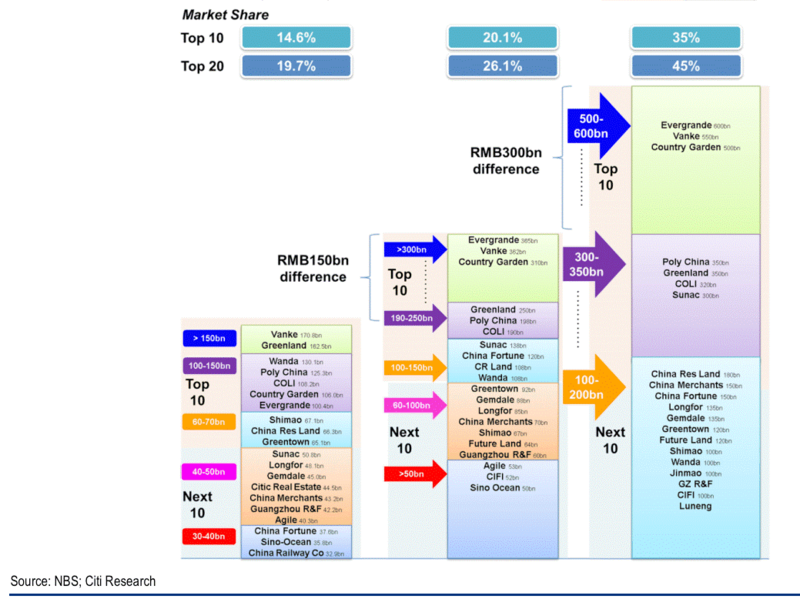 Five of the world’s top six solar panel manufacturers are Chinese, as are five of the top 10 wind turbine manufacturers. 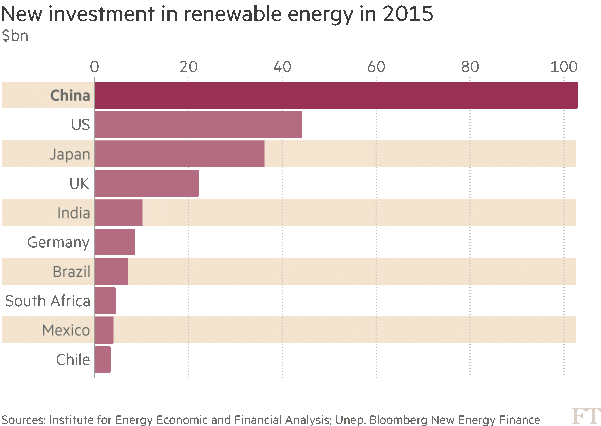 China invested $103bn in domestic renewable energy in 2015, according to Bloomberg New Energy Finance, compared with $44bn by the US. China’s National Energy Administration this week committed to further increases in years ahead with a plan for Rmb2.5tn ($363bn) of domestic investment in clean energy by 2020. China plans to expand the upgrade of biomass energy in the next 5 years as to reduce coal consumption and improve the air quality. The National Energy Administration announced on the 5th of December that the country aims to achieve the target of using biomass energy equivalent of 580 million of tons of coal yearly by 2020, as reported by China Daily. As the administration’s 2016-2020 biomass energy development plan shows, the biomass energy use will be more commercialized and industrialized by 2020. At the moment, China produces biomass energy that is similar to approximately 460 million tons of coal annually. The energy is used mostly for biogas, biomass power generation and biomass heating, but the great amount of biomass is not yet used because the proper technology isn’t ready for it. Biomass is a forestry by-product which can be used as to produce heat via combustion directly or indirectly after being converted to different biofuels. As reported by China Daily, the country is promoting non-fossil energy, including biomass energy, to power its economy in a cleaner, more sustainable fashion. The government aims to lift the proportion of non-fossil energy in the energy mix to 20 percent by 2030 from the current level of around 11 percent. At the moment, China’s energy mix is dominated by coal. The FSC Board of Directors has approved revised FSC chain-of-custody standards FSC-STD-40-004 V3-0 and FSC-STD-20-011 V4-0. The revised standards will become effective on 1 April 2017. The main purposes of this revision process were to simplify and streamline the chain-of-custody certification. Requirements have been simplified, including the addition of illustrative examples, tables, and graphics to clarify key concepts. The main content changes are the following. New transaction verification requirements: A new clause has been added requiring businesses to support transaction verification conducted by its certification body and Accreditation Services International (ASI), by providing samples of FSC transaction data as requested by the certification body. Further information on this will be communicated in the first quarter of 2017. Permitted application of percentage and credit systems at multiple site level, under certain conditions (also called “cross-site methods”): FSC will monitor the implementation of these requirements and re-evaluate them after two years. Refined credit system and product group requirements, including clarifying credit accounting for assembled wood products, and an extension of the credit accounting period from 12 to 24 months. 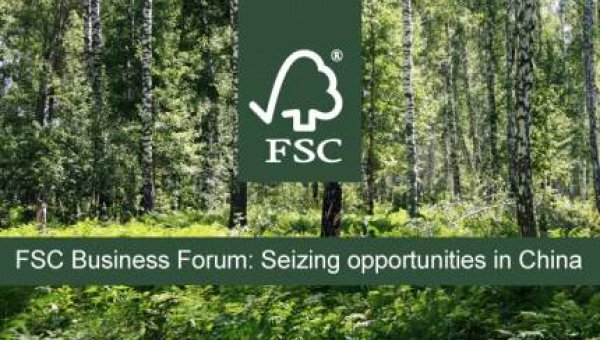 Reduce the threshold for FSC-labelled recycled wood products from 85 per cent to 70 per cent (same threshold as required for FSC Mix products). A merger of advice notes and standard interpretations is incorporated into the standard. China and the Fed: how different this time? Exactly a year ago this week, the mood in the financial markets started to darken markedly. As 2015 had drawn to a close, financial markets had seemed to have weathered the first increase in US interest rates since 2006 in reasonable shape. The Federal Open Market Committee had telegraphed its step to tighten policy in December 2015 with unparalleled clarity. Forewarned, it seemed, was forearmed for the markets. Meanwhile, China had just issued some new guidance on its foreign exchange strategy, claiming that it would eschew devaluation and seek a period of stability in the RMB’s effective exchange rate index. This had calmed nerves, which had been elevated since the sudden RMB devaluation against the dollar in August 2015. A few weeks later, however, this phoney period of calm had been completely shattered. By mid February, global equity markets were down 13 per cent year-to-date, and fears of a sudden devaluation of the RMB were rampant. It seemed that the Fed had tightened monetary policy in the face of a global oil shock that was sucking Europe and China into the same deflationary trap that had plagued Japan for decades. Secular stagnation was on everyone’s lips. We now know that the state of the global economy was not as bad as it seemed in February, 2016. 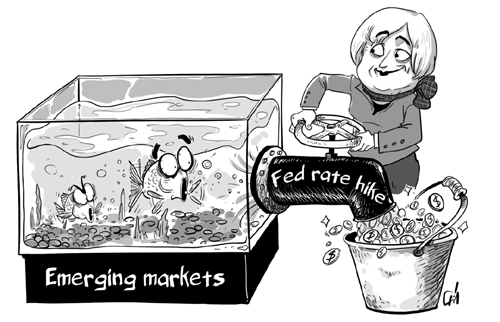 Nor was the Fed as determined as it seemed to tighten US monetary conditions in the face of global deflation. And China was not set upon a course of disruptive devaluation of the RMB. Following the combination of global monetary policy changes of February/March last year, recovery in the markets and the global economy was surprisingly swift. A year later, the key question for global markets is whether the Fed and the Chinese currency will once again conspire to cause a collapse in investors’ confidence. There are certainly some similarities with the situation in January 2016. The Fed has, once again, tightened policy, and China is battling a depreciating currency. But there are also some major differences that should protect us this time. First, consider the attitude of the Federal Reserve. The main problem, a year ago, was that the FOMC seemed hell-bent on a pre-set course to “normalize” US monetary policy, almost regardless of events in the US economy and, especially, in the rest of the world. Of course, there were many caveats in the Fed’s communication of its intentions at the time, but the basic message was that the US economy had returned close to “normal”, while the setting of monetary policy was still highly abnormal. The Fed believed that the headwinds that had slowed US growth for so long were waning, and was reluctant to believe that the equilibrium real interest rate (r*) had permanently dropped. There was scant belief in secular stagnation within the corridors of the Board’s headquarters on Constitution Avenue. The markets, however, did not agree. The large gap between the FOMC’s predictions for US short rates, and the markets’ far lower expectations, proved that investor confidence was fragile. The collapse in markets in early 2016 was driven largely by widespread fears that US monetary tightening would persist in the face of an economy that was already slowing and vulnerable. In short, the Fed seemed determined to administer an adverse monetary shock – an inappropriate tightening – on the slowing US economy, and this was spreading to the rest of the world via a possible devaluation of the RMB. Instead of the adverse monetary shock that was happening a year ago, there has been a positive shock in global economic activity. Markets have reacted accordingly. In both the monetary shock of 2015 and the activity shock of 2016, real bond yields and the dollar increased. But elsewhere the differences in market behaviour have been stark: inflation expectations have risen this time, instead of falling; and equities have surged, instead of collapsing. These are clear signs of a positive activity shock, not an adverse monetary shock. According to the model, the markets have not perceived the Fed tightening to be an adverse monetary shock this time. The FOMC is raising rates, but it appears much more concerned about foreign risks and the dollar than was true a year ago, and is less convinced about the need to return to a historic level for r*. Policy is genuinely “data determined” this year, which I think makes a hawkish monetary mistake far less likely. What about China? Here, too, the strength of economic activity is clearly helping, and the Chinese authorities have shown a readiness to protect the RMB and stimulate the domestic economy when necessary. This makes the China factor less poisonous than it was last year. However, the behaviour of the exchange rate continues to cause nervousness in markets. Before last week, the RMB’s effective index had been broadly stable for some months, but the currency had depreciated against the rising dollar. The capital outflow from China has continued at an alarming rate, caused mainly by domestic entities fleeing the currency, not by sales of the RMB by foreign investors. The authorities have been forced to prop up the RMB by running down China’s foreign exchange reserves, and by tightening loopholes in outward capital controls. But this has not been sufficient, so last Wednesday the authorities intervened forcibly to buy RMB, and to squeeze liquidity in the offshore market for the currency. The result was the sharpest two-day rise in the Chinese currency in history as short term speculators were crushed. This action was similar to that taken in January 2016, when the currency crisis last appeared to be getting out of hand. But it might also have been influenced by the possibility that incoming President Trump has threatened to label China as a currency manipulator as soon as he arrives in the White House on 20 January. Strong intervention to reverse the decline in the RBM would make this less likely – in a rational world. So will the events of early 2016 repeat themselves in the near future? Global economic activity and the changed attitude of the Fed argue not. And the gradual RMB depreciation of 2016 leaves China inherently less vulnerable than it was a year ago. But the Trump/China nexus is the risk that investors should be watching. If President Trump defies economic logic by labelling China as a currency manipulator, global market confidence could swiftly suffer a major setback. The Yomiuri Shimbun China must propel structural reforms aimed at realizing consumption-led economic growth while preventing its economy from plummeting, thus contributing to the stability of the world economy. China’s gross domestic product posted annual growth of 6.7 percent last year, the country’s lowest growth in 26 years. Annual GDP growth has slackened for six consecutive years, with the underlying tone of an economic slowdown further intensifying. Exports, the driving force of China’s economy, fell markedly. The decline is believed to stem from its weakened international competitiveness, centering on the manufacturing sector, due to rising labor costs that accompany economic growth. China’s economy is the world’s second largest after the U.S. economy and is more than twice as large as Japan’s. Since the country joined the World Trade Organization in 2001, the exports of China as “the world’s factory” have soared, boosting its GDP. Chinese President Xi Jinping has held up a policy of shifting China’s economic growth pace to a “new normal,” from rapid growth to stable domestic demand-led growth. The question is how deep-rooted the structural problems impeding the transition are. China’s 4 trillion yuan stimulus measures, implemented in the wake of the financial crisis triggered by the collapse of Lehman Brothers, propped up the world economy. Now, however, the stimulus has become a negative legacy for the country, weighing on its economy. The country’s steel industry is burdened with excessive production facilities, whose capacity is as much as four times that of Japan. Already more than half of its steelmakers are said to be so-called zombie companies, which have effectively collapsed. The liquidation of unprofitable enterprises is a very difficult problem to deal with. This is because provincial governments, which dislike increases in unemployment, oppose this. As nonperforming loans held by financial institutions have piled up, a sense of unease has spread, which stems from the real state of affairs being kept in the dark. What the new U.S. administration under President Donald Trump will do is likely to add to such worries, with Trump increasing his criticism of China, the U.S. trading partner with which it has the largest trade deficit. If trade friction between the United States and China becomes a reality, it would embroil many other countries that have deep economic ties with the two countries, and thus likely depress the world economy. China needs to expedite its efforts to correct its overproduction so as not to foster U.S. protectionism. At the World Economic Forum held recently in Switzerland, Xi said, “We must … promote trade and investment liberalization … and say no to protectionism.” He was probably trying to hold in check Washington’s hardline stance against China. But we cannot help but feel a sense of discomfort. In China there remain many restrictions on foreign capital and opaque administrative guidance and the like. Its domestic market is by no means open to foreign countries. Against the backdrop of the uncertain economic situation, capital outflows from China are continuing. The Chinese authorities have been driven to take yuan-buying and dollar-selling interventions with its foreign currency reserves, which once reached close to $4 trillion, dropping to $3 trillion late last year. China should make efforts to carry out structural reforms, such as improving the investment environment for foreign capital, rather than merely criticize protectionism. Will it end the country’s fertility woes? WHEN China’s government scrapped its one-child policy in 2015, allowing all couples to have a second child, officials pooh-poohed Western demographers’ fears that the relaxation was too little, too late. Rather, the government claimed, the new approach would start to reverse the country’s dramatic ageing. On January 22nd the National Health and Family Planning Commission revealed data that seemed to justify optimism: it said 18.5m babies had been born in Chinese hospitals in 2016. This was the highest number since 2000—an 11.5% increase over 2015. Of the new babies, 45% were second children, up from around 30% before 2013, suggesting the policy change had made a difference. Confusingly, the National Bureau of Statistics announced its own figures at the same time: it said the number of births had risen by 8% to 17.9m (see chart). These numbers were based on a sample survey of the population, not hospital records, hence the difference. But both sets of figures used valid methods of calculating a birth rate and both showed a significant rise. Yang Wenzhuang of the health and family-planning agency said the increase showed the introduction of a two-child policy had come “in time and worked effectively”. It always seemed likely that the one-child policy was a little like a dam, with couples wanting a second child banked up behind it. As soon as the flow of the dam was changed, they would have their desired babies quickly. That seems to have happened. It might also have made a difference that 2016 was the year of the monkey in the Chinese zodiacal calendar. This is considered a propitious year. Chinese couples have sometimes chosen to have a child under such a sign, rather than (say) in the less lucky year of the chicken, which begins on January 28th. So there were one-off reasons for the number of births to rise.Alas, it is far too early to claim victory. There are several reasons for thinking the rise in births is a spike, and very few causes to believe the underlying fertility rate (the number of children a Chinese woman can expect to have during her lifetime) has risen much, if at all. Even so, the increase was smaller than expected. When they introduced the two-child policy, family-planning officials forecast that between 17m and 20m babies would be born every year between 2015 and 2020—an increase of about 3m a year. In the event the increase in 2016 was only 1.3m. Moreover, if pent-up demand explains much of the increase, that influence will fade. After a brief spate, the flow of water through the dam will go back to what it was before—unless there is a change in China’s underlying fertility rate, meaning unless the average woman of child-bearing age decides she wants more children. So far, that does not seem to be happening. It is true that the short-term rise in births may be hiding long-term changes but, anecdotally, there is little sign yet of a shift towards wanting larger families. More than 30 years of relentless propaganda have persuaded most Chinese that “one is enough”. In a government survey in 2015 three-quarters of couples said they did not want a second child, citing the cost of child care and education. People’s Daily, the Communist Party’s main mouthpiece, recently lamented that China’s fertility rate, at 1.05, was the lowest in the world (others put the rate a little higher). It has fallen consistently since 1950. Even if the fertility rate were to rise, it might not be enough to offset the continuing influences of the one-child policy and the destruction of female fetuses that accompanied it. Because of these, the number of women of child-bearing age (15-49 years) is due to fall by about 5m each year in the next four years. So if the fertility rate stays the same, the number of births will start falling, because there will be fewer mothers to bear children. And that in turn would mean the remorseless greying of China would continue. At the moment, one in seven of the population is over 60. By 2050, the share will rise to more than one-third. China will need more than a change in the one-child policy or a spike in the birth rate to reverse that. China set a 2017 growth target of “around 6.5 percent, or higher if possible” as focus shifts to easing risk and ensuring stability before a twice-a-decade leadership transition this year. The objective outlined Sunday in Premier Li Keqiang’s work report to the National People’s Congress in Beijing compares with last year’s target rangeof 6.5 percent to 7 percent. Economists surveyed by Bloomberg project 6.5 percent expansion this year. Top leaders working to steady economic growth also are shifting to a more neutral policy to reduce financial risks from excessive borrowing. Economic and social stability are key priorities before President Xi Jinping and his cadres gather later for a reshuffling of top officials, which is planned for the fourth quarter. The work report reiterated that China will pursue a prudent and neutral monetary policy this year. The People’s Bank of China has left the benchmark interest rate at a record low while starting to tighten money market rates, and analysts expect further measures to cool lending without choking the wider economy ahead of the 19th Communist Party Congress. Li’s report sounded a hopeful note with the addition of language calling for growth above the target if possible, while also emphasizing the need to reduce threats to that expansion. China is confident it can keep systemic financial risk in check, and is “highly cautious” of the dangers from bad loans, bond defaults, shadow banking and online finance. Despite pledges to keep an eye on emerging risks, the credit taps are still flowing freely. Aggregate financing, the broadest measure of new credit, climbed to a record 3.74 trillion yuan ($545 billion) in January. The credit-to-GDP ratio rose nearly 100 percentage points in eight years to 260 percent by the end of 2016, according to Bloomberg Intelligence estimates. Top leaders also face external uncertainty. Potential threats include a sharp drop in exports due to slowing demand or rising trade barriers — U.S. President Donald Trump has promised tariffs on Chinese goods — and faster-than-expected rate hikes by the Federal Reserve. The work report also outlined objectives for attacking excess capacity by cutting 150 million metric tons of coal capacity this year and reducing steel capacity by 50 million metric tons. Urban home buying by both local and new residents will be supported, while another 6 million housing units will be renovated in urban areas, according to Li’s report. Financial regulation will be “proactively and prudently reformed” and the industry’s ability to serve the real economy will be strengthened, the report said. Officials also vowed to accelerate reforms of state-owned enterprises and said “more will be done to energize the non-public sector.” They also plan more support for technological innovation and the development of emerging industries. Over the longer term, policy makers aim for a 6.5 percent average growth pace in the five years through 2020 to achieve the party’s promise of building a “moderately prosperous society” with GDP and income levels double those of 2010. Xi isn’t wedded to the 6.5 percent goal due to concerns about rising debt, a person familiar with the situation told Bloomberg News in December. The upcoming Party Congress marks a critical juncture in Xi’s leadership and will show the extent to which he has consolidated support since taking power in 2012. If retirement conventions hold, 11 of 25 Politburo members — including five of seven members on its supreme Standing Committee — would be expected to step down, leaving positions open. Party leaders have repeatedly emphasized the need to maintain control before the conclave. Xi told a meeting of his National Security Commission — its first known meeting since 2014 — that safeguarding “political security” was the top priority. China Consumer Price Index (CPI) dropped to 102.10 Index Points in December (102.30 in November 2016). [v] USD/CNY fluctuated from 6.89 (December 1st) to 6.94 (December 31st) and 6.94 (January 1st) to 6.88 (January 30th)[vi]; CAD/CNY stayed level at 5.17 on both December 1st and 31st but increased from 5.17 (January 1st) to 5.28 (January 30th)[vii]. Taiwan’s GDP increased 2.6% year-on-year in Q4 2016, accelerating from the 2.0% increase in Q3, marking the fastest pace of growth since Q2 2015. The result nevertheless missed the 2.9% increase the markets had expected. Sequentially, economic growth moderated. GDP—adjusted for seasonal factors—expanded 0.5% from the previous quarter in Q4, which was down from the 1.0% rise in Q3. The headline figure continued to suggest positive economic dynamics and looking at the details, exports of goods and services accelerated substantially in the final quarter of 2016 (Q4: +8.2% year-on-year; Q3: +3.6% yoy). Imports also jumped (Q4: +9.4% yoy; Q3: +5.3% yoy), bringing the contribution from net exports to overall economic growth to 0.4 percentage points in Q4, swinging from a 0.4 percentage-point drag in Q3. In terms of domestic demand, private consumption slowed from a 2.5% increase in Q3 to a 1.3% expansion in Q4. Growth in gross investment picked up from a 3.1% increase in Q3 to a massive 8.2% expansion in Q4, supported by a strong rebuilding of inventories. On a negative note, government consumption decreased 1.1% in Q4, which was the first fall since Q1 2015. In the full year 2016, Taiwan’s economic growth was 1.4%, strengthening from the 0.7% expansion in 2015. Taiwan’s economy is one of the most exposed to China’s and Q4’s acceleration is consistent with a modest upturn in GDP growth in China in the final quarter of the year. The government expects GDP to expand 1.9% in 2017. FocusEconomics Consensus Forecast panelists project GDP to grow 1.8% in 2017, which is unchanged from last month’s forecast. For 2018, the panel estimates that economic activity will increase 2.0%. TAIPEI, Jan 9 Taiwan’s exports bounced to a four-year high in December, fuelling hopes that global demand for technology goods and commodities will keep the island’s exports strong through the first quarter. The third monthly rise in exports, however, was not enough to help full-year shipments stay out of the red or subdue worries about rising global trade protectionism. The island’s tech-dominated manufacturers are nervous about the policies of incoming U.S. President Donald Trump, who has threatened to raise tariffs on imports from some countries when he takes office on Jan. 20. “We cannot assess the exact impact. It is only after he takes office that we will know exactly how he will implement (his policies),” Beatrice Tsai, an official with Taiwan’s finance ministry, told a news conference on Monday. Tsai said improved momentum reflects the global recovery and also stronger orders ahead of the long Lunar New Year holiday at the end of January, when factories in China and Taiwan grind to a halt. “We expect double-digit growth extending into the first quarter of this year. However, it would be a difficult job to maintain the same level of growth beyond the first quarter,” said Tony Phoo, Northeast Asia senior economist at Standard Chartered Bank. Taiwan’s recent export-related data could signal a stronger first quarter, which tends to be a cyclically weaker period and is coming from a low base. A measure of manufacturing activity in December showed operating conditions at their best in nearly six years and pointed to new business ahead at home and abroad. Annual exports in December rose 14 percent, beating a 10.4 percent forecast in a Reuters poll and the fastest pace since January 2013’s 21.9 percent gain. Exports to China – where many Taiwan factories are located – leapt 21.4 percent, finance ministry data showed. Shipments of electronic components, and the sub-category of integrated circuits, showed solid gains of more than 20 percent in December, while those related to smartphones rose just over 9 percent, data showed. Exports of base metals, chemicals and transportation equipment posted double-digit growth. But full-year exports fell for a second year in a row by 1.7 percent, while imports dropped 2.6 percent. Goldman Sachs cautioned that rising trade barriers could limit export growth prospects in Asia this year, and it expects little monetary tightening in the region even if the Federal Reserve keeps raising interest rates. “Downside risks to exports from increased trade protectionism look substantial,” the investment house said in a research note on Monday. Taiwan’s trade surplus with the United States, its second-largest trading partner last year, fell to $4.92 billion, compared with $5.35 billion in 2015 and is down from highs of as much as $8.8 billion five years ago, ministry data showed. Taipei, Jan. 18 (CNA) The Taiwan Ratings Corp. (TRC) has predicted that Taiwan will see growth of 2 percent in its gross domestic product (GDP) this year and a 2.5 percent rise in 2018, surpassing the levels of both Hong Kong and Singapore. Taiwan’s economic growth will jump from 0.9 percent in 2016 to the levels forecast by the rating agency’s mother company, Standard & Poor’s International, the TRC said in its 2017 Taiwan Credit Outlook report, published on Wednesday. The 2 percent GDP growth for this year will be higher than the 1.7 percent predicted for Hong Kong, and the 1.3 percent for Singapore, the report said. In the report, South Korea is forecast to achieve GDP growth of 2.7 percent in 2017, the highest among the so-called “Four Asian Tigers” — Taiwan, Hong Kong, Singapore and South Korea. GDP in 2018 will see growth of 2.9 percent in South Korea, 2.5 percent in Taiwan, 2.0 percent in Hong Kong and 2.0 percent in Singapore, according to S&P’s rating. TRC credit analyst Lan Yu-han said Taiwan’s economic development will benefit from a gradual recovery of the U.S. economy in the coming two years, as well as economic stability in the emerging countries. These two factors are expected to help boost Taiwan’s exports in the near future, Lan said. However, the growth momentum might be slow in the first few months of this year due to a slow recovery in mainland China and Europe and increasing competition from other exporters, Lan said. If interest rates rise in an economic forest and no one hears a central-bank statement, do they still make a tightening sound? This is the metaphysical question of Chinese monetary policy these days. Last week the People’s Bank of China nudged up rates on a series of short-term liquidity tools that lenders can tap if short on cash. But it left benchmark rates untouched and also offered no explanation for its moves. Still, its intentions seem plain enough: worried about a property bubble and excessive credit growth, the central bank wants to tighten monetary conditions. At the same time, it hopes to avoid panicking financial markets or weighing too heavily on growth. So far, investors remain content, pricing in mild downward pressure on stocks and bonds, and not overreacting. But the Chinese central bank is walking a tightrope. It has only taken the first step; keeping balance will get harder. THE omens for the Chinese yuan seemed bad heading into 2017. The capital account looked as porous as ever, making a mockery of the government’s attempts to fix the leaks. The new year, when residents received fresh allowances for buying foreign currency, was due to bring even more pressure. Analysts braced for a stampede for the exits from China. The yuan had fallen sharply at the beginning of 2016, catching them by surprise. This time, they were ready. Instead, the yuan began the year as one of the world’s star performers. This was particularly so in the offshore market, where foreigners trade it most freely. It gained 2.5% against the dollar over two days in the first week of 2017, its biggest two-day increase since 2010, when trading began in Hong Kong, its main offshore hub. Within China itself, price increases were more subdued, but the yuan still climbed to a one-month high. Currency markets are notoriously fickle, so it is dangerous to read too much into a few days of price swings. But in China the government has always had a tight grip on the yuan. So the currency’s strength raised the question of whether it was simply being propped up—or whether the yuan’s prospects were in fact improving. The Hong Kong rally has the Chinese central bank’s fingerprints all over it. The proximate cause was a shortage of yuan in Hong Kong. As its residents have turned away from the Chinese currency, deposits there have fallen to just over 600bn yuan ($86.7bn), their lowest level since early 2013. That has led to periodic liquidity squeezes, making the cost of borrowing yuan in Hong Kong prohibitive: the overnight rate soared to 61% at the start of 2017. In normal circumstances, central banks would be expected to inject money to ease such shortages. But the Chinese authorities did little to stem the cash crunch, pleased to see it hurt those betting against the yuan. To make money by “shorting” a currency, investors borrow it, sell it and then hope to buy it back after its value has fallen. With borrowing rates so high, this becomes all but untenable. As the liquidity squeeze has abated in recent days, the offshore yuan has pared its earlier gains. China’s success in defending the yuan suggests that, as the government tightens capital controls, they are having more effect. In the past two months it has started reviewing all transfers abroad by companies worth $5m or more. Transfers by individuals will also soon face more scrutiny. The controls should slow the erosion of China’s foreign-exchange reserves, which are down to $3trn from $4trn in 2014. Most important, the Chinese economy is sounder than it was two years ago, when the yuan’s gradual descent began. A property boom has breathed life into heavy industry. Producer-price inflation is running at its fastest in more than half a decade. The central bank is tightening monetary conditions, however gingerly. As China’s economic and policy cycles more closely track those in America, there is less scope for runaway strength in the dollar, which in turn takes pressure off the yuan. Even so, many of the factors remain that led the yuan to drop by 7% last year, its steepest fall on record. The broad money supply is still growing at a double-digit rate. Chinese companies and households still have a ravenous appetite for foreign assets. Most analysts expect the yuan soon to start falling again, though that consensus is no longer rock-solid. China’s central bank has long said that it wants to make the yuan more volatile and less predictable. On that score, it has surely succeeded. China has appointed Guo Shuqing as the new head of the banking regulator, according to people familiar with the matter. Having spent much of his life working on transforming the nation’s financial system, Guo, 60, faces daunting tasks ahead as he takes on oversight of the world’s largest banking industry by assets. Below are five charts highlighting some of the biggest issues. Shadow banking is now in every segment of China’s financial system, prompting authorities to work together to address growing risks. The central bank and the securities, banking and insurance regulators are drafting new rules for asset-management products that have swollen to almost $9 trillion as of June 30. So-called wealth-management products issued by banks surged 30 percent last year, making them the largest component of the banking system that exists largely outside of lenders’ balance sheets. Banks have increased reliance on funding their operations by borrowing from each other with short-term instruments such as negotiable certificates of deposit, raising risks of a liquidity shock. Difficulty selling the securities is fueling concerns that smaller lenders could face cash crunches and even miss payments. China’s largest lenders are expected to post their first decline in annual profit in more than a decade. Earnings growth has slowed in recent years because of swelling bad loans and pressure on lending margins. Policy makers’ recent drive to reduce financial-system risks is squeezing banks. 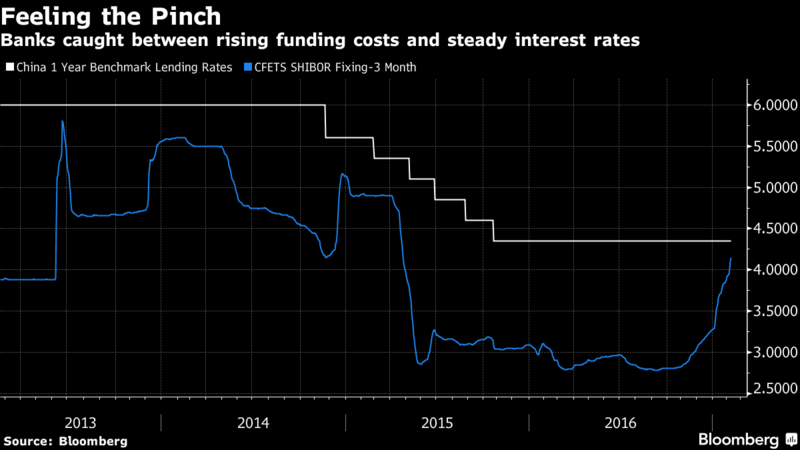 Caught between the central bank’s intensifying efforts to raise short-term borrowing costs, and benchmark interest rates that haven’t moved since 2015, Chinese lenders have few options but to absorb much of the higher costs. China’s economy is growing at the slowest pace in a quarter century, adding urgency to the banks to clean up bad loans. Official figures on soured debts are widely believed to understate the true scale of the problem, with CLSA Ltd. estimating the non-performing loan ratio at 15 percent to 19 percent for 2015 — about 10 times higher than the official 1.67 percent. WHEN Jim Anderson first lived in Mongolia in 1993, there was one local word foreigners could not help but learn: baikhgui, which translates as “absent” or “unavailable”. Bread? Rice? Electricity? Often as not, they were baikhgui, he recounts in a blog post for the World Bank, for which he has returned to Mongolia as country director. Even those lucky enough to have American currency to spend in “dollar shops” received sticks of chewing gum as change. Mongolia thought it had left those days far behind. A mining boom (copper, coal, gold) has transformed the country, filling the shops with goods and the cities with cranes. From 2009 to 2014, the economy grew by 70%. In 2012 alone, it attracted foreign-capital inflows equivalent to some 54% of its GDP. But since 2014 commodity prices have fallen, foreign-direct investment has reversed and a number of daunting debt payments have crept closer. Mongolia’s foreign reserves have dwindled from over $4bn in 2012 to little more than $1bn at the end of September, equivalent to about four months of imports. Foreign creditors were about to learn the word baikhgui. Enter the IMF. This month it agreed to lend Mongolia about $440m over three years to help it avoid default and rebuild its reserves. Assuming the agreement is approved by the fund’s board, it should unlock another $3bn or so from the Asian Development Bank, the World Bank, Japan, South Korea and others. China should also help. Irked by the Dalai Lama’s visit in November, it imposed new duties on Mongolian goods and delayed lorries at the border. A little over 50% of Mongolians identify as Buddhist. But almost all the country’s exports (84%) are sold to China, making it the most China-dependent exporter in the world (see chart). Mongolia’s government has apologised for the “misunderstanding” caused by the visit and said it will not permit a repeat. It now hopes China will extend a 15bn yuan ($2.2bn) swap line. The strings attached to the IMF’s loan are more conventional. They include keeping the central bank out of “quasi-fiscal” activities: it had bought cheap-rate mortgages worth 1.95trn togrog ($787m), helping to support a housing bubble in a country known for nomadism. At the IMF’s urging, the government is also distancing itself from the management of the Development Bank of Mongolia, a state lender that accounts for over a fifth of credit in the country. Mongolia’s prospects should improve. Copper and coal prices have recovered somewhat. The economy will also benefit from heavy investment in Oyu Tolgoi, a copper mine operated by Rio Tinto. But Mongolia has turned to the IMF twice in eight years. If it does not manage the next commodity cycle better, it might find that its benefactors’ patience is baikhgui. The country can also meet its economic growth target of 6.8 per cent set by the Government thanks to these advantages, Forbes said. According to Forbes, US President-elect Donald Trump is expected to scrap Trans-Pacific Partnership (TPP), the 12-nation trade agreement that would particularly help member Việt Nam as an exporter. However, there are some who suspect Trump will somehow salvage it. If not, according to Forbes, Việt Nam already takes part in 16 free trade agreements (FTAs), including with economic powerhouses China and Japan. It can pursue bilateral agreements with other TPP members if the US Congress declines to ratify the deal signed in 2016. Việt Nam is also on the list to join a Chinese-championed Regional Comprehensive Economic Partnership trading group that would encompass 30 per cent of the world’s GDP. Besides this, Việt Nam will also keep giving foreign companies reasons to invest, Forbes said, adding that foreign investors already benefit from lower tariffs under the trade deals. Some also get lavish tax breaks. In 2015, the country made its rules on foreign investment clearer and sped up permit processing. Last year was a “transition year” for those changes, and in 2017, Việt Nam will start to “collect the fruits of having a more structured and competitive business legislation, which has had an impact on attracting more FDI and also helped Việt Nam become one of the major manufacturing hubs in the world,” Forbes quoted Oscar Mussons, international business advisory associate with Dezan Shira & Associates consultancy in HCM City, as saying. In addition, Vietnamese people are getting richer and spending more. The country’s middle class will double by 2020 to 33 million people and that means more consumption, the Boston Consulting Group estimated last year. People in that group earn at least US$714 per month, enough for phones, motorcycles, travel and health products, items that usually make the short list of local consumer preferences. The middle class has got where it is because wages are rising along with a boom in jobs linked to growth in export manufacturing. According to Forbes, factory work in Việt Nam is moving up in value from traditional industries. High-tech’s share of total exports from the country reached 25 per cent in 2015 from five per cent in 2010 and kept going last year, with no signs of abating currently. Investments by electronics giants Hon Hai Precision, Intel and Samsung – worth billions of dollars – have led the shift. Samsung Display is considering a new $2.5 billion investment in a project already worth about $4 billion, according to a stock market research firm in Hà Nội. Electronics are replacing traditional industries, such as garments and shoes, production of which is slowly moving to other Asian countries. Policymakers in Việt Nam aim to increase annual export value by 8-10 per cent this year, Louie Nguyen, editor and founder of the news website Vietnam Advisors, said. The trend will bring new skills, higher wages and more revenue for those companies making high-value products. During Japan’s go-go 1980s, Hiromi Shibata once blew a month’s salary on a cashmere coat, wore it a few times, then retired it. Today, her daughter’s idea of a shopping spree is scrounging through her mom’s closet in Shizuoka, a provincial capital. ….The U.S. appears to be leading other parts of the globe out of an extended era where central banks relied heavily on low and negative interest rates and stimulus to jump-start growth and keep prices from falling….Japan remains definitively stuck, despite a long and aggressive experiment with ultra-low rates. A quarter-century after its property bubble burst, a penny-pinching generation has come of age knowing only economic malaise, stagnant wages and deflation—a condition where prices fall instead of rise. ….Since then, annual growth has averaged less than 1% amid periodic recessions. 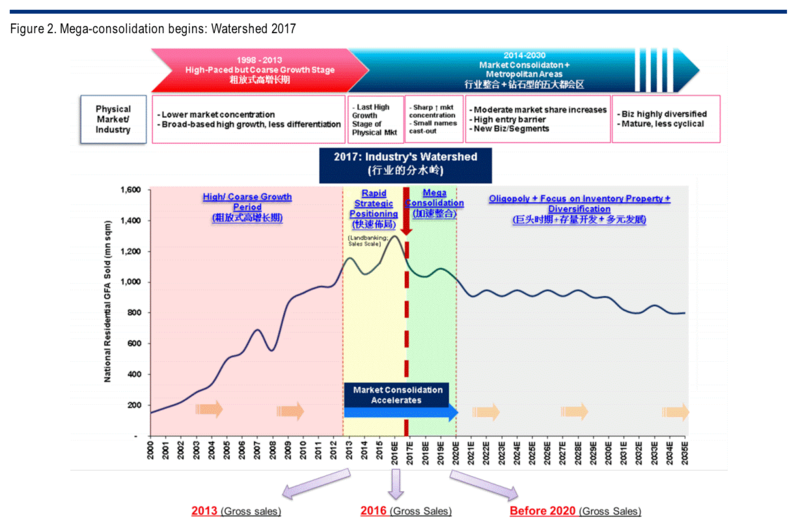 Prices began falling in the late 1990s….Many economists believed the Bank of Japan’s 2013 stimulus would be enough to jolt the nation out of its downward spiral of weak growth and falling prices….Some economists contend the government should try even more fiscal stimulus and monetary easing. Others argue the stimulus has already saddled Japan with so much debt—now 230% of gross domestic product—that it could end in an economic collapse. This is GDP per capita. That is, the amount of stuff that Japan produces for each person in the country. Over the past two decades it’s grown 20 percent. And aside from the Great Recession, that growth has been pretty steady. It’s not declining. It’s not stagnating. Under the circumstances, Japan is doing fine. Each of their workers is as productive as ours, and their productivity has actually grown a little faster than ours. But there’s only so much you can do when your population is declining. Given the demographic realities, Japan is probably doing about as well as they could. There are two things I take away from this. First, there’s not much the Bank of Japan can do to stimulate their economy. It’s already running pretty well. Second, despite this, Japan is suffering from persistent deflation. Why? If their economy is productive and growing, deflation shouldn’t be any more of a problem for them than it is for us. Somehow, though, the very fact of a declining working-age population—and, since 2011, a declining overall population—seems to be driving deflation. This is very mysterious, especially since Japan’s deflation has persisted even in the face of massive BOJ efforts that, according to conventional economics, should have restored normal levels of inflation. So why didn’t it? Is it really a consequence of demographic decline? Or is it something else? December total wooden starts improved 6.6% to 45,974 units. Post and beam housing increased 4.9% to 34,572 units. Pre-fab wooden starts fell 4.5% to 1,109 units and total pre-fab fell 4.1% to 12,179 units. Platform frame construction gained 13.9% to 10,293 units. Two by four starts broke down as follows: custom ordered single family units rose 11.9% to 2,716 units; rentals gained 16.8% to 6,422 units and built for sale speculative housing increased 1.6% to 1,122 units. March total housing starts registered a faint increase of 0.2%, finishing at 75,887 units. Although owner occupied housing starts fell 3.6%, rentals posted an 11% gain. Rental housing recorded a 17th consecutive monthly gain. Total wood starts posted a small 0.9% gain thanks to strength in the post and beam segment. Post and beam starts increased 2.9% to 31,471 units. Wooden pre-fab starts slid 7.4% to 949 units. Two by four starts declined 4.6% to 9,116 units broken down as follows: custom built owner occupied fell 8.0% to 2,161 units; rentals gained 0.5% to 5,921 units and built for sale spec homes declined 5.0% to 1,011 units. VietNamNet Bridge – Vietnam economy will encounter more difficulties in 2017 than in 2016 amid global geopolitical changes and financial uncertainties, experts say. Many economists have said that the 6.7 percent GDP growth rate target set by the government for 2017 was too ambitious as Vietnam only obtained 6.21 percent growth in 2016. In the context of the increased budget deficit, fiscal policy would not help support growth. Therefore, it is highly possible that monetary policy loosening will be maintained. However, some forecasts say it would be difficult to maintain the current stable interest rates. Some commercial banks have raised interest rates again, while bad debt, the exchange rate and higher requirements on capital adequacy ratio will affect the interest rate. If interest rates go up, this will affect businesses’ demand for lending. This means the credit growth plan may be unattainable and loose monetary policy will not bring desired effects, affecting the GDP growth plan. Some forecasts say it would be difficult to maintain the current stable interest rates. Some commercial banks have raised interest rates again, while bad debt, the exchange rate and higher requirements on capital adequacy ratio will affect the interest rate. In the last three years, credit has been growing, nearly reaching 20 percent. Some international institutions have warned that rapid monetary policy loosening would bring high risks to the economy. Regarding the dong/dollar exchange, Governor of the State Bank Le Minh Hung said the dong lost only 1.2 percent of its value in 2016. However, analysts do not believe that modest depreciation will continue in 2017. If US President Donald Trump expands fiscal policy, the US dollar would continue appreciating in the world market and capital flow would head for the US, thus putting pressure on new emerging economies like Vietnam. Meanwhile, the zero percent ceiling interest rate on dollar deposits has made it less attractive to bring dollars to Vietnam. The overseas remittances (kieu hoi) to Vietnam decreased sharply in 2016, but the foreign currency supply was still plentiful thanks to increased disbursement in Foreign Direct Investment (FDI), the trade surplus and foreign portfolio investment. In 2017, the capital flow to Vietnam may change direction as a result of the US FED decision on raising the prime interest rate, the US policy on attracting enterprises to invest in the US and the failure of the TPP trade agreement. Vietnam gained the trade surplus of $2.7 billion in 2016 thanks to the increase in exports and the decrease in imports caused by the domestic weak demand. Meanwhile, in 2017, Vietnam’s export would bear the impacts from the devaluation of many currencies in the world against the dollar. The stronger Vietnam dong would encourage imports, which means that the trade deficit may return. This was stated by Bùi Chính Nghĩa, deputy head of the Ministry of Agriculture and Rural Development’s (MARD) Forestry Department. HÀ NỘI — The wood processing industry faces a lot of difficulties in the future following the government’s order close natural forest gates from January 1. Nghĩa said this would result in a cut of some 40,000 cu.m. of raw material this year. Ensuring timber supply for domestic manufacturing is a problem in Việt Nam as a large amount of raw timber is exported despite many domestic producers lacking raw material. Sharing his opinion on this proposal, Huỳnh Kim Báu, assistant to the director of Saigon Furniture Co. Ltd, said the government should levy a tariff of 30-35 per cent on raw timber exports, the same level as applied by some regional countries, such as Cambodia and Thailand, to lower exports. In addition, enterprises need to plant high-quality tree species that grow in a short period of time to meet the industry’s increasing demand. Huỳnh Văn Hạnh, deputy chairman of the Handicraft and Wood Industry Association of Hồ Chí Minh (HCM) City, said small- and medium-sized enterprises (SMEs) needed to co-operate with each other if they wanted to compete with foreign firms globally. Hạnh said Việt Nam had more than 4,000 timber processing and export businesses but only seven per cent of them were large and could easily access huge orders from clients from the United States, Japan and the European Union. The remainder, which was small and medium enterprises, had weak competition capacity and small investment capital, hence they faced more difficulties while seeking orders. Dương Phương Thảo, deputy director of the Import-Export Department under the Ministry of Industry and Trade, said Việt Nam exported processed wood worth US$7 billion in 2016, while global demand stood at $400 billion for wood products. Việt Nam’s wood industry, he said, must grow further to capitalise on the huge global demand. Thảo added that the Vietnamese Government planned to negotiate with its Lao and Cambodian counterparts to create better conditions for Vietnamese firms to source timber from forests in these countries to increase the supply of raw material. HÀ NỘI – Việt Nam will have some 116 warehouses at the border gates with Laos and Cambodia by 2035, according to the Ministry of Industry and Trade. Under Decision 229/QĐ-BCT issued on January 23, the ministry said it would develop professional and modern warehouses with enough logistics services to keep import and export goods at these border gates. The warehousing system will promote sustainable development of import and export activities along the border lines, especially exports at border gates along border lines between Việt Nam and the two countries. According to specific targets of the plan, by 2025, the warehousing system will meet all demand of the area and have enough capacity to store import and export goods at the border gate regions. Eighty per cent of the warehouses will be required to provide important and necessary logistics services, such as storage, handling, inspection and implementation of customs procedures for import and export goods. The plan includes the upgrade or building of at least one warehouse at an international border gate region or a major border gate to meet the demand of import and export goods. All goods under the warehousing system will be inspected for quality, food hygiene, safety and other related standards. The ministry expected the plan to ensure stability and step-by-step promote growth of imports and exports at border gates along border lines between Việt Nam and the two countries. MOSCOW, January 14. /TASS/. Project of a direct railway corridor between Russia and Japan will require budgetary funding of no less than 75% of the total costs, Russian Transport Minister Maxim Sokolov told reporters on Friday. Along with it, he admitted the corridor was “a project for next decade”. He added that it was too early yet to specify the cost of the project but private investment might cover one-fourth of it at the very best. He recalled along with it that the regions of the Russian Far East were located in a zone of high seismic risks and Russian safety standards prohibited construction of tunnels there. To get down to the implementation of the momentous project, it was also important to assess the prospective size of the transit cargo flows between Europe and Japan via Russia, Sokolov said. Dr. Pavel Ivankin, the Director General of the Institute for Research on Railway Transport, a direct railway corridor between Russia and Japan might cost around 1 trillion rubles (around $ 16.13 billion). He believes that construction of links between Sakhalin and mainland Russia, as well as Sakhalin and Hokkaido should begin simultaneously and is likely to take from three to five years with account of exploration and engineering works. Dr. Ivankin pointed out the high potential of the hypothetical transit route in terms of passenger service, saying along with it that the prospects for cargo haulage through it required more detailed assessments. Vice-President of Russia’s state railway corporation RZD Vyacheslav Pavlovsky told TASS earlier construction of a permanent overpass between Sakhalin and the mainland might cost an estimated 400 billion rubles (around $ 6.5 billion). The following numbers don’t paint a pretty picture. India has seen a steep decline in new investment proposals since demonetization was announced on November 9, according to data by the Centre for Monitoring Indian Economy, Mint reported. The October-December quarter saw Rs1.25 trillion in new investment proposals, nearly half of what each quarter had seen in new investments in the last nine quarters. India’s factory activity plunged into contraction last month as the cash crunch severely hurt output and demand, according to a survey by the Nikkei/Markit Manufacturing Purchasing Managers’ Index, which fell to 49.6 in December from November’s 52.3, its first reading below the 50 mark separates growth from contraction since December 2015. The impact of note ban seems to be weighing on industrial output with core sector growth decelerating to 4.9% in November 2016 as against 6.6% in the previous month, according to data released by the commerce and industry ministry. For the month of November, India’s monthly services activity fell to its lowest level since the 2008 financial crisis. The Nikkei/Markit Services Purchasing Managers’ Index sank to 46.7 in November from October’s 54.5, the first time since June 2015. According to data provider, MHS Markit: The cash-driven economy saw financial services, hotels, restaurants, renting, and business activities suffer the most as consumers curbed discretionary spending. In addition to the services sector, cement production expanded by only 0.5% in November, against 6.2% in the previous month while steel output rose 5.6% against 16.9%. According to Aditi Nayar, principal economist, Icra, while the slowdown in core sector growth in November 2016 has been somewhat modest, the growth of cement and steel output slowed sharply in November 2016 compared to previous month, a clear indication of the short-term impact of the note ban on domestic demand in cash-intensive sectors such as construction and real estate. Rimin Dutt is Business Editor, HuffPost India. This article first appeared on Huffington post India. The number of unemployed people in India is expected to rise by 1 lakh in 2017 and another 2 lakh in 2018, according to the International Labour Organisation (ILO). The ILO predicted that the number of jobless will increase from 17.7 million in 2016 to 18 million by 2018 even though the country’s unemployment rate is expected to go down from 3.5 per cent to 3.4 per cent in 2017. Globally, the ILO reckons that the number of jobless people will increase by 3.4 million in 2017, in its report on World Employment and Social Outlook for 2017 released late Thursday, with projections based on econometric modelling carried out in November 2016. The global unemployment rate is expected to rise modestly from 5.7 to 5.8 per cent in 2017 as the pace of labour force growth outstrips job creation. “In fact, almost one in two workers in emerging countries are in vulnerable forms of employment, rising to more than four in five workers in developing countries,” said Steven Tobin, ILO senior economist and lead author of the report. The report has clubbed India in the category of emerging nations. The number of workers earning less than $3.10 per day is even expected to increase by more than 5 million over the next two years in developing countries. Global uncertainty and the lack of decent jobs are, among other factors, underpinning social unrest and migration in many parts of the world. “A coordinated effort to provide fiscal stimulus and an increase in public investment that takes into account each country’s fiscal space, would provide an immediate jump-start to the global economy and reduce global unemployment in 2018 by close to 2 million compared to our baseline forecasts,” the ILO said. “Manufacturing growth has underpinned India’s recent economic performance, which may help buffer demand for the region’s commodity exporters,” the report said. Disruption and pain caused by demonetization has spun off the greatest market opportunity in India’s history. Disruption to a long established socio-economic system, and its accompanying comfort of symmetry, was one universally agreed outcome of demonetization in India, regardless of which side of the debate you stood. The pessimistic expectation of a rancorous miasma of dysfunction faded away giving rise to ingenuity and innovation to “get things done” — good or bad. In an interconnected wireless world, a world without boundaries, market disruption is the norm, and it has been the quickest path to bring innovative products and services to customers, leading to rapid economic growth. Yes, the disruption and pain caused by demonetisation has spun off the greatest market opportunity in the history of India — to fast-track high-speed internet access to every single citizen of this country — that too by disrupting the conventional business models of mobile telecom operators who continue to focus only on high net worth individual (HNI) and enterprise markets at the expense of the less privileged in the society. India with a land mass of 2.9 million square kilometre, excluding area under inland water bodies, and a population of 1.3 billion requires high-speed internet access. We have one of the lowest internet access speeds in the world ranked at a low of 105, with average speeds around 4 Mbps against global average of 6.3 Mbps, China’s 5.7 Mbps and Singapore’s 18 Mbps. Although our mobile use penetration is close to 48 per cent with around 600 million mobile users, active internet users are only 33 per cent of the population or around 462 million. While demonetization disruption precipitated this opportunity when it was realized that high-speed internet access is required across the country for cashless transaction and transformation to digital economy, this opportunity was always there. But as they say, market desperately requires a jolt to realize rivers of golden opportunities. How can India quickly secure high-speed internet access without relying on highly capital intensive and technically complex 4G and 5G mobile telecom network rollout? The strategic business opportunity for connecting India is through internet protocol, rather than solely depending on 4G and 5G mobile network expansion. How can we quickly increase internet access through Wi-Fi access? Primarily through the cable and dish TV service operators who have penetrated close to 90 per cent of the households in India. These TV operators are beginning to realise the power and possibilities of their fiber optic cable covering almost the entire Indian landscape and have slowly started transforming themselves into internet service providers (ISPs) and started offering Wi-Fi internet access as part of their service portfolio. The reason for their slow pace of transformation, especially in rural India, is mainly because the bulk of these operators are unorganised and a typical owner-operated cable TV service provider may own only 10 to 15 km of cable and cover 100 to 200 households. But their combined cable TV service penetration in India is around 90 per cent against active internet users of 33 per cent. Mobile phone operators are aiming to take the maximum share of internet access through mobile phone service and package the internet access offer with value added services such as music, videos, and other bells and whistles. Of course, these are of no use if primary high-speed internet access is not available. Hence, the case for broadband access to internet using a smartphone and secured quickly through the fiber optic cables delivering TV channels to households. When we consider that cable TV service providers can cooperate and through Wi-Fi boosters and routers provide a seamless internet access service to those on the move also, and can quickly cover a typical densely populated panchayat or block-level area, the stage is all set for an innovative disruption in the internet access market using a smartphone device. The theatre will become even more appealing given the poor infrastructure for mobile voice service, especially when the quality of applications such as Skype through internet protocol has become better than the often dropped out voice calls service provided by mobile telecom operators. To succeed in the innovation and secure high-speed internet access across India, disruption of the cozy markets of mobile operators and their brand power is required. This can be done by the yesteryears’ brand leaders such as Nokia, Ericsson and Blackberry (NEB). Apple and Samsung disrupted the mobile phone market dominated by NEB since the advent of mobile phone technology with touch screen smart phones that also included a camera, dictaphone, music and video storage. These phones were largely beneficiaries of telecommunication technology’s evolution from plain second-generation (2G) voice service to 4G and 5G now. The new age handsets like Apple and Samsung built their brand through their enabling power to use new generation technology to transit and transact data at high speed — information and entertainment or infotainment, and data transaction or e-commerce functions. Yes, like our good old Ambassador cars that stood watching Indian market swept away by the Japanese and European manufacturers, NEB were too shocked to act when their market share fell precipitously and remained as onlookers at the four corners of fast technological changes that gripped the interconnected wireless world. The brands failed to move with time and embrace possibilities afforded to the customers through the evolution of mobile telecom technology. But let us not yet write the epitaph of the fallen mobile phone brand leaders of 90s, as they are trying to come back with a thunder led by Nokia 6. The return of Nokia, and the possible return of Ericsson and Blackberry from the ruins of its early mobile handset empire could mark an important mile stone in the history of wireless communication market in India. How can this happen in a crowded market of smartphones and, especially when China is pumping out newer models at such alarming speed? NEB needs to do two things to make a big comeback. Firstly, disrupt the existing market where voice and SMS are fast becoming obsolete and then leverage its nostalgic brand value. Nokia 6 for example, needs to disrupt this market by forming partnerships with companies that offer broadband services to customers. Companies like Tikona or Kerala Vision which are in the process of wiring customers to high-speed Internet could be the ideal partners for Nokia for their return. How would such partnerships help Nokia? Partnerships with players other than the mobile telecom operators will fast-track its market penetration and disrupt voice service selling mobile operators, but most importantly become the catalyst to bring together India’s rich diversity on an internet access-based communication platform. And how can Nokia leverage its nostalgic brand value to disrupt the market held by other major brands and take on telecom operators? Consumers may say, I already have my Samsung, Apple, Micromax and all the Chinese brands. Why do I need a Nokia? Can Nokia really do better than all the current brands? Can they overtake the Samsung, Apple and the Chinese brands common in the market today? Can Ericsson and Blackberry really make a comeback? Yes, it is possible. NEB can change the whole smartphone market like they did for the mobile market in the 1990s. How can they do this? If NEB can unearth its brand power and use it to re-connect India, then it would be possible. For most of us, Nokia was the first phone that we owned. Do you remember the first mobile phone you used to call your husband, then your college sweetheart? Or the first time when you called from Manhattan subway to your mother in Kumbhakonam or Varanasi? Chances are it would have been a Nokia phone. Most people still fell nostalgic when they think of the days when they owned the Nokia 3310 or the Nokia 3210 and had so much fun connecting with people. Strangely enough, that was Nokia’s tagline — connecting people. And they were really good at that. Research in consumer behaviour shows that nostalgia is a critically important ingredient for brand loyalty. Nostalgia takes us back to those days which give us sweet or dystopian memories of life many of which were defining moments in our personal life. And we look back and think to ourselves — if only we could live those moments one more time, or if only we could have avoided those low moments. Just like Maggi leveraged nostalgia for the brand in their comeback, mobile handsets can also use their residual brand equity to return to the market. In his last interview with The New York Times, US President Barack Obama said in part “much of our politics is trying to manage this clash of cultures brought about by globalisation and technology and migration, the role of stories to unify — as opposed to divide, to engage rather than to marginalise — is more important than ever”. This fits in so well with the Nokia’s tagline of connecting people across India that Obama could well have been speaking of what NEB can do in India. The single biggest requirement of India post-demonetisation is high-speed internet access across the country. To secure the goal of digital India, we need to develop that strange sense of defamiliarisation with the symmetry and rhythm we are lectured to by the developed nations, where umpteen number of fiber optic cables don’t run through slums and tied to rubber and banyan trees. Fast-tracking seamless high-speed internet access of around 20 Kbps can only be through innovation in India. That will also be a disruption to those mobile operators who continue to play the market by developed nations’ rule book. So Nokia, Ericsson and Blackberry, would you please DE familiarise with the old India you were connecting, get away from the comfortable symmetry you were used to and rediscover the new India for re-connecting it through high-speed internet access? “India has an inward domestically demand-oriented economy, which is good when global growth factors are not exactly healthy,” IMF’s India chief said. India’s economy is in a “fairly good shape” and it is likely to be less affected than other emerging economies if there is a further shock to the global economy, according to a senior official of the IMF. “We’ve seen pretty tepid global growth rates in the recent past. If there’s any adverse shock to the global growth and thereby global demand, we think India will not be unaffected but will be less affected than other countries which rely on exports and trade far more than India does,” Paul A Cashin, Assistant Director in IMF’s Asia & Pacific Department, and mission chief of India, told PTI. “Until demonetisation there was very healthy consumption spending in India, which was basically propelling economic growth. India has an inward domestically demand-oriented economy, which is good when global growth factors are not exactly healthy,” he said. “That’s why we think India will be, I’m not going to say immune, but less affected than other emerging economies if there’s a further shock to the global economy, including a general global slowdown,” Cashin said. The International Monetary Fund this week in its annual report on India, projected the growth to slow to 6.6 per cent in 2016-17 fiscal due to “temporary disruptions” caused by the demonetisation of high-value currency notes in November. It, however, said demonetisation would have only short term impact on the economy and it would bounce back to its expected growth of more than 8 per cent in the next few years. The near-term adverse economic impact of accompanying cash shortages remains difficult to gauge, while it may have a positive economic impact in the medium term, it added. “The external sector seems to be quite under control these days. Just on the inflation side, because of these eruptions in food prices which happen from time to time, now that they have formal inflation targeting, they need to properly implement a monetary stance to achieve their inflation targets,” he said. “Once the short-term dislocation to consumption from demonetisation passes, there’ll be a little bit of a growth downturn this fiscal year, including the first quarter of the upcoming fiscal year. But after that, India should resume its previous above eight percent growth path in the medium term,” Cashin said. In its annual report, the IMF said in the absence of disruptive global financial volatility, slower growth in China, Europe and the United States would have only modest adverse spillovers to India, given weak trade linkages. “On the external side, despite the reduced imbalances and strengthened reserve buffers, the impact from global financial market volatility could be disruptive, including from US monetary policy normalization or weaker-than-expected global growth,” it said. To establish the wood-based industry in India, the state forest department will issue about 500 new licenses. These licences would be issued online, the through an e-citizen service — grant of license to establish wood-based industries — which is being developed by the forest department. “Setting up such industries would encourage planting of more trees under farm forestry, and help achieve the goals of Haryana Forest Policy. Licences to already-established wood-based industries would also be renewed online,” said the state forestry minister Rao Narbir Singh. “The department had already launched two e-citizen services — permission for felling of trees and NOCs in respect of Punjab Land Preservation Act, 1900, forest and restricted lands — last February. These two services have been integrated with Right to Service Act,” he said. But city-based environmentalists are welcoming the government’s decision, with caution. “Wood prices have declined significantly in the last few years. Issuance of new licences should hopefully lead to increased processing, demand and better prices for Haryana’s farmers in the future. At the same time, care should be taken in locating the units at a distance from existing forests,” said environmental analyst Chetan Agarwal. “Growing trees for timber requires a long gestation period, say about 5-7 years. In this period, if demand falls, farmers will lose out. We need a balance between demand and supply of timber, in order for the farmer to benefit from this move,” he added. Others said this will bring more transparency in the department. “Now that the government has decided to issue new licences to wood-based industries, this will bring more transparency as earlier, people used to sell their licences for a price. Also, since the already existing licenses will be renewed online, it will bring transparency and efficiency in the system, as the file can be tracked online by anyone,” said another environmentalist. Currently, digitisation of block forest areas in 14 districts have been carried out by the forest department during 2016-17, through the Haryana Space Applications Centre (HARSAC). The digitisation work is also in progress for the districts of Mahendergarh, Ambala, Kurukshetra, Mewat, Gurgaon, Faridabad and Rewari. The department had planted 141.01 lakh saplings over 18,842 hectares during the same period while 31.56 lakh plants have also been sold or distributed. Under the ‘Har Ghar Hariyali’ programme, aimed at increasing green cover, over 12.58 lakh saplings have been planted in various households. Rao Narbir said nature education and awareness programmes have also been launched from Kalesar, to sensitise people about preserving and protecting natural resources. Nature Education and Awareness Centres have been established at Hisar, Jind and Bhindawas for this purpose. She said huge potential exists in the Cambodia, Laos, Myanmar and Vietnam (CLMV) nations for Indian manufacturers. JAIPUR: India and the South East Asian nations, including Myanmar and Cambodia, are enhancing land and sea connectivity to boost trade and are working on various projects such as Kaladan Multi-Modal Transit Transport, Union Minister Nirmala Sitharaman said today. India and Myanmar are cooperating to connect the Bay of Bengal ports (Visakhapatnam-Krishnapatnam) and the Sittwe port (in Myanmar), Sitharaman told reporters here. She was speaking here for the 4th India-CLMV Business Conclave, organised by industry body CII. “Sittwe is a major port in Myanmar. If Sittwe is connected with our Bay of Bengal ports, Visakhapatnam, Krishnapatnam and also south Chennai or even further up to Haldia, Paradaip or Dhamra, a lot of trade which goes from India to these SEA countries can go and land in Sittwe and from there go to Myanmar or CLMV countries,” she said. As regards the land connectivity, she informed that the work is being expedited for the Kaladan Multi-Modal Transit Transport project (KMTTP). It aims to improve connectivity between Indian ports on the eastern seaboard and Sittwe port in Myanmar. The Myanmar government has stated that it will expedite the work from its side, she said, adding that the Indian side of the work is progressing. This project, she said, would technically connect Kolkata through the north eastern states of India to the entire South East Asian nations. On improving the air connectivity, she said that a lot is happening between SEA and India in this area and from Gaya airport, there is a need to give more connections. “We want more aircraft to go from there. Also, from Assam and Guwahati airports as from other parts of India. We want to connect with the Southeast Asian countries…lot of discussions are going on. These are international negotiations, so they do take time,” Sitharaman added. On a project in Bangladesh, she said that through Petrapole, the undersea linkage for Internet facility “is something on which India and Bangladesh are working”. It will improve the Internet connectivity of the north east states. South Korea’s exports fell 5.9% on-year to US$495.5 billion in 2016 from a year earlier due largely to a drop in global demand and weak oil prices, while its imports dropped 7.1% on-year to US$405.7 billion. Trade surplus stood at US89.8 billion in 2016, down slightly from US$90.3 billion a year earlier. Despite the prolonged economic slowdown, South Korea’s consumer prices grew 1% in 2016 from a year earlier, sparking concerns over whether South Korea could face stagflation and the South Korean government expects the country’s inflation would go up 1.6% in 2017 on the back of rising oil prices. Local consumer spending has also remained weak throughout 2016 amid a steady increase in household debt. South Korea’s unemployment rate in 2016 was 3.7%, the highest since 2010, inching up 0.1% point from 2015.The exchange rate for Canadian Dollar averaged at 885.30 won in December, 2016, up by 3.34% from 856.66 in December, 2015 and also up by 2.42 % from 864.34 in one month earlier. South Korea’s housing starts in year-to-date November of 2016 increased 2.3% to 106,029 buildings from a year earlier 103,632 buildings. Housing permits in the same period also increased 5.7% to 119,494 buildings from a year earlier 113,027 buildings. The boom in the construction industry in recent years is expected to slow in 2017 due to possible fall in home prices caused by the tightened government policy on real estate and increased interest rate. The number of wood building permits and wood building starts in year-to-date November of 2016 also increased 10.2% to 15,582 buildings and 10.4% to 13,855 buildings respectively compared with those in 2015. Both total floor areas of wood building permits and starts in the same period of 2016 remarkably increased to 13.5% and 14.9% to 1,371,153 m2 and 1,246,114 m2 respectively from a year earlier. BC softwood lumber export volume to South Korea for the first eleven months of 2016 increased 3.4% to 252,651 cubic meters as compared to 235,005 cubic meters for the same period of 2015. However, export value for the same period of 2016 slightly decreased 0.4% to CAD$66.821 million as compared to CAD$67.086 million in 2015. For the year-to-date to November of 2016, BC’s SPF shipment to South Korea increased 4.1% to 238,871 cubic meters while shipments of Hemlock, Western Red Cedar and Douglas-Fir plunged 30%, 59% and 64% to 6,659m3, 906m3 and 931m3 respectively. Condos like these in Seoul are now harder to flip under new rules. The South Korean housing market is rapidly cooling thanks to new rules that make it difficult for homeowners to flip properties. With the sole growth engine now losing steam, the country’s economic future looks increasingly murky. According to KB Kookmin Bank, one of the country’s major banks, the pace of increases in home prices slowed sharply to 0.07% in December from a month before. The growth rate had been above 0.2% in October and November. Greater Seoul was especially notable for how fast price increases decelerated in December, to 0.1% from close to 0.4%. The government in November decided to rein in the housing market. Buyers of new condos in Seoul’s Gangnam and three other districts where home prices had been soaring now have to move in before they can sell their units. Also, homebuyers in Seoul and some parts of its urban footprint are now banned from flipping their properties in the first 18 months of signing sales contracts. As a result, sales for the purpose of immediate resale have apparently dwindled. Since 2014, the government has introduced a series of measures designed to buoy the economy. It has raised the cap on housing loans relative to the value of the property and allowed borrowers to take on more debt. A series of interest rate cuts by the Bank of Korea, the central bank, also helped pull money into the housing market. The number of newly built homes doubled from 200,000 units in 2010 to 400,000-500,000 units got built in 2015 and 2016. As a consequence, household debt at the end of September had more than doubled from 10 years earlier to 1.295 quadrillion won ($1.08 trillion). This eye-opener was what prompted the government to curb borrowing two months later. The Bank of Korea, meanwhile, is unlikely to further cut interest rates for fear of chasing capital out of the country and into the U.S., where rates have been rising lately. The housing oversupply, therefore, is likely to persist. There are other economic hangovers. Exports, long a major driver of South Korea’s economy, have been queasy, mostly due to China’s economic slowdown. Then, local unicorns, or startups with over $1 billion valuation, came under scrutiny: Ecommerce giant Coupang, which had raised a record $1 billion from Softbank the year before, was criticized for its massive operating losses while building out its rapid-delivery infrastructure. Yello Mobile, a startup holding company that earned a $4 billion valuation in 2015, took four loan investments last year but its valuation never budged, leading to increased suspicion as it reportedly streamlines ahead of an IPO. And Korea saw the first casualty of its most promising startups, as the $18 million-funded Beatpacking Company closed its 3-year-old music streaming service Beat in November owing to mounting royalty expenses without a clear profit model. Yet when the clouds parted, things weren’t so bad at all. Thanks in part to a last-minute frenzy of activity in December, we found a sprawling garden of newly funded startups, with some leaders strengthening their roots with fresh investments. If we exclude Coupang’s record investment in 2015, last year was the best yet for funding Korea’s modern generation of startups, and investors are eager about thriving new industries like fintech, cybersecurity and health tech. Excluding Coupang’s investment in 2015, last year was the best yet for Korea. Data: TheVC. Graphs: Ryu Ji-min. Rising startups like Memebox and Woowa Brothers (creators of Baedal Minjok) continued to power through 2016 with fresh investments. Data: TheVC. Graphs: Ryu Ji-min. The biggest funding rounds are usually backed by global investors, who bridge the gap created by local venture capital firms with low spending power. Data: TheVC. Graphs: Ryu Ji-min. South Korea is still the world’s most innovative economy, according to the 2017 Bloomberg Innovation Index. Bloomberg’s proprietary index ranks countries according to research and development spending, value-added manufacturing, patent activity, high-tech density, higher education, productivity, research concentration and other factors. score of 89.00. What’s remarkable in South Korea’s case is the fact that it ranked a dismal 32nd in productivity among all innovative economies. South Korea did, however, rank top in the world in R&D intensity, manufacturing value-added and patent activity. It ranked in the top five in high-tech density, tertiary efficiency and research concentration. Sweden moved up one spot from 2016 to second place despite the current government’s less business-friendly policies including potentially crippling labor taxes. However, the Swedish people, unlike many of its European neighbors, promote an atmosphere of personal ambition as opposed to emphasizing the collective. Russia was the most notable loser in the index and fell 14 spots from last year to No. 26. The country suffered from economic sanctions and low energy prices. Israel was the lone country to move into a top 10 spot this year, while France was the lone country to lose its position as one of the top 10 most innovative economies. South Korean household income grew at the slowest pace on record last year and spending fell for the first time, underscoring the challenge facing policy makers as they try to ignite a sluggish economy. Households’ average monthly income increased 0.6 percent in 2016 from the previous year to 4.4 million won ($3,884), the smallest gain since the statistics office began compiling the data in 2003. Consumption expenditure dropped 0.5 percent, with larger drops seen in transportation and clothing expenses, data from the statistics office showed on Friday. The weakness in household income reflects slowing growth amid a political scandal that has led to theimpeachment of President Park Geun-hye. The situation worsened in the fourth quarter, when the scandal erupted, with income growth slipping to 0.2 percent from a year earlier and spending falling 3.2 percent. Korea’s economy expanded 0.4 percent in the fourth quarter from the previous quarter, the slowest pace in more than a year. While exports are faring better than expected as the global economy strengthens, consumption is falling short of forecasts and sentiment remains poor, the Bank of Korea said on Thursday. The central bank sees the economy growing 2.5 percent this year, the slowest pace since 2012. The tepid income growth last year was due to “job growth slowing on a delay in the economic recovery and corporate restructuring,” the finance ministry said in a separate statement on Friday. Household spending as a percentage of disposable income, excluding items like taxes and pensions, fell to 71.1 percent, also the lowest on record going back to 2003. “Spending is typically large for households with children, and the low birth rate and aging are factors we see as decreasing consumption,” Kim Bo-kyoung, an official at the statistics office, said in a briefing in Sejong. How powerful are Malaysia’s sultans? IT HAS been two years since the scandal surrounding 1MDB, a Malaysian state investment firm from which billions of dollars have been looted, began to attract attention around the world. During that time Malaysia’s prime minister, Najib Razak, has hung on to his job despite claims that nearly $700m of the firm’s money passed through his bank accounts. The opposition fears that heavily gerrymandered elections, due in 2018 but generally expected to take place this year, will hand Mr Najib’s party (which has led Malaysia for 60 years) yet another term in power. All this has prompted some Malaysians to wonder whether the country’s several sultans could be persuaded to intervene. But how much power do they really have? Although more than 40 countries retain a monarch of some sort, Malaysia’s system is probably the world’s oddest. The country has nine sultans, who as well as reigning ceremonially in their own states take it in turns to serve five-year terms as Yang di-Pertuan Agong, the head of state of the entire country. The sultans meet three times a year and are considered guardians of the culture and religion of the ethnic-Malay majority, though they have little formal authority. In the early 1990s Mahathir Mohamad, a long-serving and combative prime minister, managed to push through constitutional amendments withdrawing the sultans’ power to veto state and federal legislation, and curbing their legal immunity. His reforms were helped along by public outrage at royal misdeeds—particularly those of the late Sultan Iskandar of Johor, who was convicted of assault and manslaughter for the fatal beating of a golf caddy and only escaped prosecution thanks to his immunity as head of state. Despite Mr Mahathir’s efforts, the sultans’ role and the precise limits of their authority remain subject to wide interpretation. In recent years the royals are seen to have grown more active, both in politics and in business. In 2014 the Sultan of Selangor, a wealthy central state, chose not to endorse the chief minister nominated by the local government; he ended up picking from a list of alternative candidates which state legislators were persuaded to supply. In Johor, a southern state just across the causeway from Singapore, the prerogatives of palace and parliament have sometimes blurred—notably in 2015, when the outspoken local sultan (the eldest son of Sultan Iskandar) appeared to order state lawmakers to forbid the sale of e-cigarettes. Full and frank debate about these kinds of interventions is made fraught by an archaic law on “sedition”, which occasionally sees jail sentences handed to Malaysians accused of insulting royalty. For the moment Malaysia’s scandal-hit government looks unlikely to face any meaningful opposition from its royals. Although their influence is ticking up, the sultans are hardly popular or powerful enough to tie the hands of Mr Najib’s administration; they would probably emerge diminished from the constitutional crisis any such efforts would engender. And it is also not clear that the sultans would benefit were the country’s multi-cultural opposition to take office. A weak and pliable central government is probably an asset for any royals aspiring to restore their palaces’ wealth and power. Asia’s only military dictatorship will begin a face-saving operation after the new king on Tuesday refused to endorse a new constitution. The 20th since 1932, it is the country’s most illiberal yet; critics say it was designed by the junta that has ruled since a coup in 2014 to hold back democracy. Maha Vajiralongkorn is thought to disapprove of its curtailment of royal powers. His highly unusual intervention could delay a general election that had been scheduled for this year; he will have to endorse a new version first. Polls had already been delayed by the prolonged period of mourning that will precede the cremation of his father, Bhumibol Adulyadej, in October, and by his own coronation, for which the palace has not yet set a date. The conditions for democracy in Thailand—a demilitarisation of politics and a DE sacralisation of the monarchy—remain absent. THE agencies are anonymous and unobtrusive amid the glamorous hustle of Shanghai, the better to stay in the shadows. They deal in an illegal but highly desirable product: people, specifically Filipina domestic workers to serve China’s growing middle class. Filipina helpers, says one agent, will follow your exact instructions, whereas locals are choosy and tend to handle only one task: if they clean, for instance, they will not look after children. Filipinas’ diligence makes them popular. The Philippine consulate in Hong Kong estimates that more than 200,000 undocumented Filipinas work as domestic helpers in China, earning 5,000 yuan ($728) per month, far more than they could make back home. As for legal troubles, the agents are reassuring. Fines can be hefty but are rarely imposed. One agent admitted that a client was caught employing an illegal worker; the worker was sent home, but the client was not fined. Another Filipina no doubt took her place. The Philippines abounds with labour, and China needs domestic workers. This exemplifies two demographic trends in Asia. Poor, young South and South-East Asian countries suffer low wages and underemployment, while richer, ageing countries in the north need more people to bolster their workforces. Theoretically, this problem contains its own solution: millions of young workers should go north and east. Receiving countries would benefit from their labour, while their home countries would benefit from their remittances and eventually from the transfer of skills when the workers return, as many migrant labourers do. Practice, however, is less accommodating than theory. The Asian “model” of migration tends to be highly restrictive, dedicated to stemming immigration, rather than managing it. Entry is often severely curtailed, permanent settlement strongly discouraged and citizenship kept out of reach. Asia is home to about half of the world’s people, but is the source of only 34% of its emigrants and host to only 17% of its immigrants. About a third of Asians who have left their country have laid their hats somewhere else in Asia. But despite wide income and age gaps between one end of Asia and the other, two-thirds of intra-Asian migrants remain in their own part of the region. South Asians migrate elsewhere in South Asia, East Asians stick to East Asia, and so on. Much of this labour is irregular. Thailand, for instance, may have as many as 5m migrant workers, mainly from neighbouring Myanmar, Cambodia and Laos. Many of them lack visas—particularly those in construction and services. Three years ago, a rumoured crackdown on illegal labour sent around 200,000 Cambodians fleeing for the border. The resulting paralysis of the construction industry, among others, prompted Thailand to reverse course quickly and implement a brief amnesty during which workers could apply for temporary documents. Some workers do not bother with those, complaining that the process of getting them is too time-consuming and expensive. Still, millions remain willing to take the risk of working illegally or semi-legally in Thailand because wages back home are so low. China has long been able to satisfy its demand for labour by moving rural citizens to cities. Over the past 30 years around 150m Chinese have left the countryside to staff factories, cook in restaurants and clean homes. But with China’s population ageing, foreign workers have begun filling the gap: as many as 50,000 Vietnamese illegally cross the border into the southern province of Guangxi each spring to help harvest sugar cane. In 2015 the provincial government started a programme to bring Vietnamese workers into local factories in one city. Off to a good start, it is being introduced in other parts of Guangxi. China remains a net exporter of labour, but the balance is shifting quickly. Over the next 30 years its working-age population will shrink by 180m. How China handles this fall will play a large role in shaping Asian migration patterns. Manufacturers can move factories to labour-rich countries, or invest in automation. Other industries lack that option. The ILO forecasts that China will need 20m more domestic workers as it ages. The impending collapse of the workforce is not an exclusively Chinese problem. To keep the share of its population at working age steady, East Asia would have to import 275m people between the ages of 15 and 64 by 2030. South-East Asia would have to attract 6m, though that number masks wide gaps: Singapore, Malaysia, Vietnam and especially Thailand need workers, while Myanmar, Indonesia and the Philippines have too many. South Asia, meanwhile, could afford to lose 134m workers—India alone could send more than 80m abroad—without worsening its dependency ratio. China’s projected shortfall in 2030 is equivalent to 24% of its current working-age population; in Bangladesh the likely surplus is 18% (see map). Some countries have become more flexible. Foreign workers are around 40% of Singapore’s workforce, with slightly less than half of those on restrictive domestic-work and construction visas. To prevent foreigners from undercutting domestic wages, employers must pay levies for each foreign worker they hire. Such financial incentives can help regulate inflows of foreign workers. They can also help encourage outflows, ensuring that temporary migration does not become permanent. In 2003 South Korea introduced a quota scheme allowing small firms, mostly in labour-intensive manufacturing, to employ foreigners from poor countries for limited periods—“sojourns”, as the authorities put it, of up to four years and ten months. To make sure that the sojourners do not overstay their welcome, they are charged in advance for the cost of returning home. Their employers also deduct a percentage of their salary, which is given back to them only as they leave the country. (It can be paid to them in person after they pass the immigration desk.) These temporary workers account for about a quarter of the 962,000 foreigners (3.5% of the labour force) now working in South Korea. Japan has long preferred exporting capital to importing labour. Its multinationals have set up plants across South-East Asia to make Japanese goods, bringing factories to foreign workforces, not the other way around. But this approach has its limits. For the sort of non-tradable services especially in demand in ageing countries, such as domestic care and nursing, it is useless. Japanese companies can build their cars in Vietnam, but their executives cannot (or at least ought not to) send their mothers to Danang when they start to get frail. Hong Kong has opened its borders to foreign nurses, nannies and maids. It introduced a scheme to import domestic workers in 1974: the same year, coincidentally, that the Philippines adopted its policy of encouraging people to find jobs overseas. By the end of 2015 Hong Kong had over 340,000 foreign domestic “helpers”—one for every 7.3 households. Over half still come from the Philippines, with another 44% from Indonesia. Their employers must provide food, board, travel to Hong Kong and wages of at least HK$4,310 ($556) a month. Including those costs, as well as the implicit cost of their rent, they earn a little less than a Hong Konger working 60 hours a week at the minimum wage—but much more than they would at home. By the mid-2000s, over half of married mothers with a college degree in Hong Kong employed foreign domestic help. By taking on duties traditionally shouldered by wives and mothers, these foreigners have made it easier for many local women to pursue careers outside the home. Governments often worry that immigrants will be a substitute for native employment, rather than a complement to it. Hong Kong’s foreign maids were both. They “displaced” local women from unpaid employment in the home. But in so doing, they provided a powerful complement to their paid employment outside it. Foreign domestic workers may have other beneficial side-effects. A study of the United States showed that immigrant inflows lower the cost of child care and modestly increase fertility rates among native women with college degrees. Immigration may therefore have a triple benefit for Asia’s ageing societies. Foreign workers add to the labour force themselves, they help native women take fuller part in it, and they help them bear the workers of tomorrow. What a pity Asia does not make more use of them.